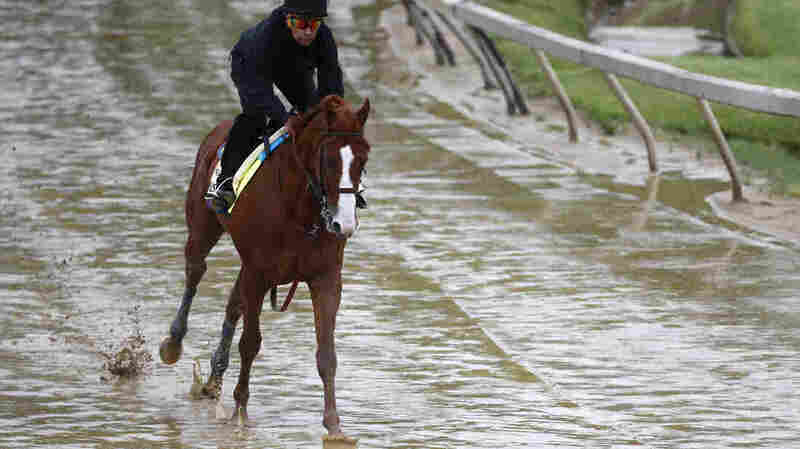 Kentucky Derby Winner Justify Is Favored To Win Soggy Preakness : The Two-Way An eight-horse field is set for Saturday's race at Baltimore's Pimlico Race Course, and it's expected to be a two-horse race: Justify and Good Magic. Kentucky Derby winner Justify, with exercise rider Humberto Gomez aboard, gallops around the track Thursday at Pimlico Race Course in Baltimore. The Preakness Stakes is scheduled to take place Saturday and Justify is the favorite. While it's a field of eight horses, it's expected to be a two-horse race: Justify and Good Magic. Justify is a 1-2 favorite for the Preakness. The Kentucky Derby winner drew the seventh post in Saturday's race — the same post he had at the Derby. Justify had a bruised heel more than a week ago, and The Associated Press reports there are concerns it "could get irritated from a couple of days working out in mud and how the surface might complicate the start." The AP reports: "Trainer Bob Baffert is happy that the bruise on Justify's left hind foot hasn't bothered the colt during his morning workouts at Pimlico since arriving Wednesday. If Justify breaks clean and gets over the 1-3/16 mile race with no discomfort in that heel, even the strongest competitors are likely running for second." The strong showing expected from Justify energizes this year's talk of a Triple Crown winner. The last was American Pharoah in 2015. Both of those horses have something in common: Hall of Fame trainer Baffert. Earlier this week, he told TMZ that Justify is a "superior" animal to American Pharoah.